Just after New Year (Jan 2014) we went for a walk in Shadmoor Park and ended up on Ditch Plains Beach. 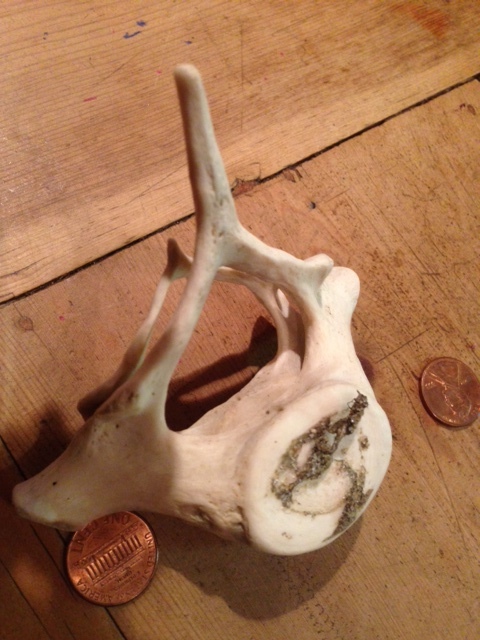 That is where I found two vertebrae still stuck together by ligaments. They were larger than human vertebrae, measuring 3-4 inches in the largest diameter. A quick phone call to my biologist friend, Marguerite W, confirmed that these were mammalian bones and not from a large fish, like a shark. Fish vertebral bodies (called the centrum) would be biconcave, as shown here. These were not. Then, I had a phone call with a friend, Annie Sessler. She is a well known artist out here who makes beautiful fish prints! Her husband Jim, is a Montauk fisherman. ‘Some kind of whale’ or marine mammal was their opinion. Now I was really intrigued! Then I got this rare book from the Cornell Vet School library called “Whales of the World” by Spencer Wilkie Tinker (1988). It describes in detail all 77 species of living whales on this planet and also a bunch of extinct species based on fossil records. It was a stroke of luck that we could identify the vertebrae (which were stuck together) as C7, T1. That’s the last cervical and the first thoracic vertebrae. The thoracic vertebrae have an articular joint surface for a rib on either side. All mammals have 7 cervical (neck) vertebrae. Giraffe’s have very long ones. Some animals have very short ones. 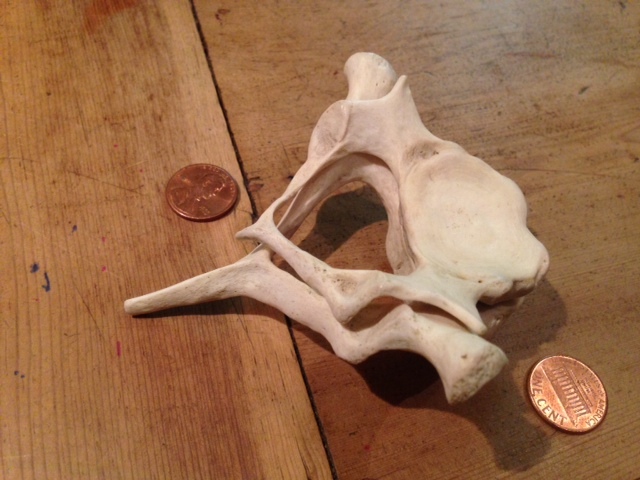 And sometimes the cervical vertebrae are fused together! However, C7 in our case was not fused to either of its neighboring vertebrae, T1 or C6. The “common dolphin” has fused C1-7, according to “Whales of the World”. 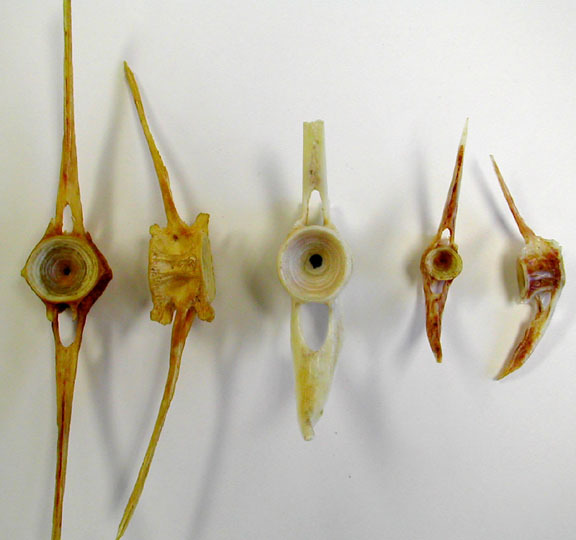 Therefore we did not think that these were vertebrae from the common dolphin. In the same book, there is a photograph on page 39 of a side view of a cervical spine of the common dolphin. To my astonishment T1 looked just like the T1 vertebra that we found! So, we were thinking of a close relative of the common dolphin. In particular, there were lots of sightings and on-line reports about bottlenose dolphins around Long Island. Apparently there has been an epidemic due to a type of measles virus and it has killed hundreds of bottlenose dolphins in our waters (in the Long Island sound and around Montauk). This species has apparently been migrating northwards as witnessed by the larger numbers spotted since about 2007. Dolphins: A Fleeting Glimpse? About increased numbers of bottlenose dolphins in Long Island Sound. 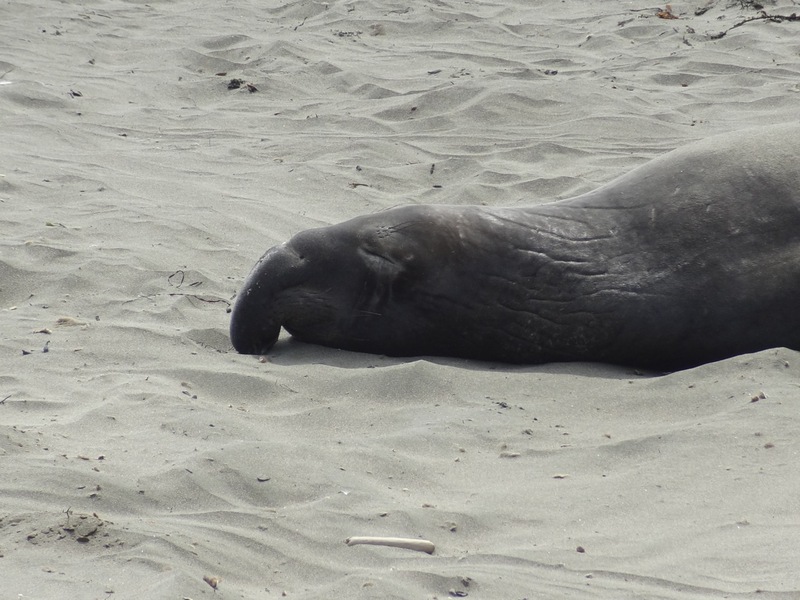 Having been introduced to this species by their bones, I noted that these are in fact very interesting animals! Bottlenose dolphins can recognize themselves in a mirror! They can use sponges as tools and transmit cultural knowledge across generations. Their considerable intelligence has driven interaction with humans. I am now an official dolphin fan! In the summer of last year I met a young couple at an art fair in Montauk. Anthony was an actor and Laura, an oncology nurse. They lingered at my booth, then left… and then he returned alone. Anthony wanted to set up a meeting to discuss a custom ring and he wanted to surprise his wife! My kind of man. 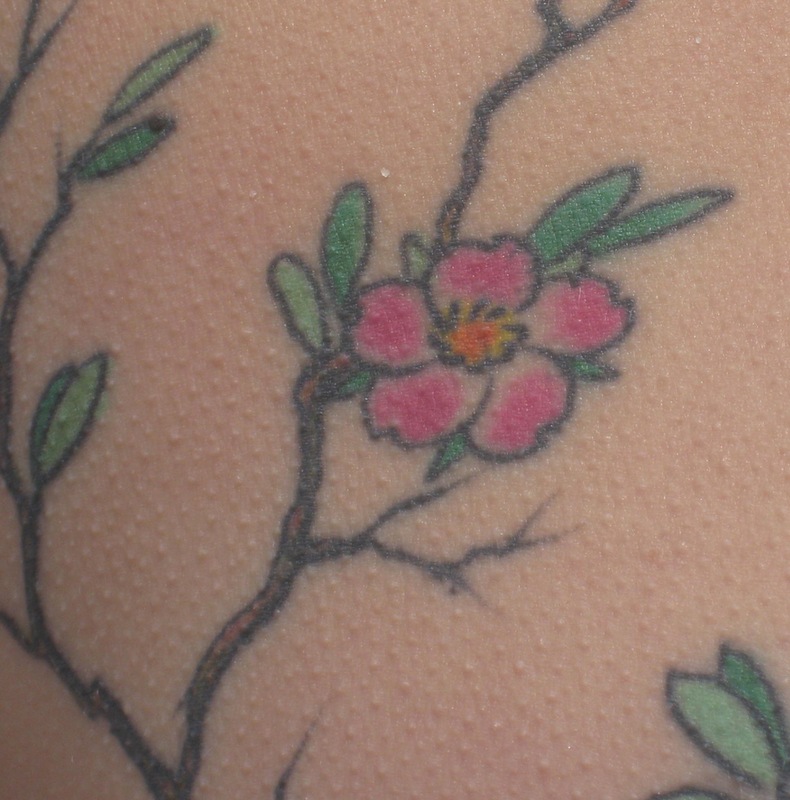 She had a full body tattoo of a Japanese cherry blossom tree. He wanted a gold ring representing a cherry blossom. We met in the city at a coffee shop on the west side. There were drawings first. Then I set to work on a wax model. A 5 karat black diamond in the rough was placed in the center and 5 trillion (triangular) diamonds were placed between the petals of the ‘flower’. Anthony was involved at every step. There were more meetings at the coffee shop. About a half dozen meetings. The model was approved and a gold ring was cast. Then the stone setter went to work. My Russian friend Oleg did this part. His work is excellent. Finally, the “finish”, a polished exterior and a roughed up organic interior representing the cherry blossom. See the image of “The final product”. Then came the suspense. He would surprise her on a special occasion. Would she like it? I was nervous…. A week later the report: she was happy! And so were we! The job took 4 months. Great customers! A fun experience. This is how we do custom work. If you are a parent of a teenager, like myself, you must sometimes be wondering about the complete discrepancy in artistic tastes between your teen and yourself. I have tried to understand. It’s as if they are a different species. They speak differently (no full sentences), they have a different vocabulary (chillaxin) , they use abbreviations that are meant to be obscure to adults (AYSOS = are you stupid or something), they don’t use telephones or even email any more. They are considered “digital natives” by those who study societal trends and by those that are interested in marketing of on-line businesses. I find myself asking my teen whether to sign up for Skype versus Oovoo, or whether to buy an I-phone or an Android. In both cases it’s clearly the latter. With such strong opinions and with tastes that differ from those that are just 5 years older, it’s clearly important to study teens because they are the customers of tomorrow. The following is a quite unscientific study of teen fashion tastes. Note the bright colors, the matching blue sweat shirt and cell phone, but the contrasting red nail polish, and purple hair dye. Note the snake ring (definitely cool) and the LOVE mood ring which changes colors depending on your mood (so they say). Colors need to be shocking and full of contrast. Second, jewelry accessories for piercings are BIG. I was referred to a website called bodycandy.com. Although body piercing is an ancient practice in different human cultures, there is perhaps a new worldwide trend that is gaining traction. In particular the prevalence of body piercings in young teenage girls has increased and is now often over 25-50% in countries like the USA, Britain, Germany, Switzerland, Italy and Australia according to numerous publications. Is this the future? Third, accessories that have a special or personal meaning are in. Woven wrist bands as symbols of friendship, often handmade for someone special, are popular. Plastic bangles reading I LOVE BOOBIES or SAVE BOOBIES are in. They mean to increase awareness for breast cancer. Similar bangles for different causes (or just for fun) are popular, in part because of their low cost. Low cost is really important for teens. Wearing a large number of bangles on the same wrist is trendy too. While some of these accessories will no longer be popular when these teens morph in to young adults and have more money to spend, I think the principle of wearing a statement that has a special personal meaning, or a message, may remain important. In deed, silver and gold jewelry with inscribed comments or insignia, or names of your children are already popular with young women and mothers. Never a dull moment with a teen in the house! This is a special Christmas and Holiday season 2012. At least for us. We are travelling for a family gathering and there is no need for a tree and all the usual sparkly decorations. But on my walk this morning in the dog park (in Springs East Hampton) I spotted a little lonely evergreen which looked quite adorable in the morning mist, better than any tree that we could have purchased. There were twigs with red rose hip and a rainy morning had left glittering rain drops as sparkling decorations. Who needs a Christmas tree with such natural splendor? My daughter Yelyi agrees that raindrop sparkles are festive. Here is her picture taken through the car window. There are other reasons to be thankful. Mother nature with all her might taught us all a lesson just weeks ago, see my earlier post. Families right here on Long Island are still struggling with major damage to their homes and cars. Our beach is now back to “normal” but a small flag serves as a reminder. Our beach (Maidstone Park Beach) has other treasures and keeps on surprising me. There is a lone couple of Great Blue Herons that have stayed “home” this year. Occasionally these majestic birds do not migrate and take their chances. According to Cornell University’s ornithology site, Long Island is apparently in the zone where Great Blue Herons can stay all year round. I have been observing them for the last few weeks. They hang out at the same place every day known for an abundance of shell fish. One of them stays close to shore but usually scatters when I appear with my German Shepherd! It is beautiful to watch them fly just a few feet above the waters of 3 Mile Harbor. Our beach has other treasures such as stunning views of the sunset. Jewelers, beading and lapidary enthusiasts, and those that work with sea glass have a common problem: How to make a hole in their material, be it stone, precious or semiprecious gems, or glass. I have worked with beach stones for about 12 years. They come in different hardness measured on a 1-10 Mohs’ scale. The quarzites are hard (7 on the Mohs scale) and the sedimentary or sand stones are much softer (about 3-5 on the Mohs scale) and therefore easier to drill. We use a Dremel drill. Take a look at the comments to this post about different models of Dremel drills. We use cylinder drill bits that are coated with diamond dust (simply called diamond drill bits). I buy them in bulk because we use so many. I am out of bits again and I just scoured the web for suppliers. This post is about how to choose a supplier! Drill bits come in very different quality, so you want to choose carefully. First, lets consider the different types of bits. There are 1) cylinder bits, 2) twisted bits, 3) shank bits, 4) core bits, 5) crinkled core bits, 6) cintered core bits. If you are not sure what this means you can check out pictures of these bits at Dad’s Rock Shop. I have tried choices 1-4. Considering the cost, I still prefer the simple cylinder bits or the twisted bits. They are much cheaper. Most sources have a variety of sizes to offer. And you can buy in bulk. They work for really hard stones and they work with glass. In terms of how long they last before they are totally dulled up, it’s your technique which is most important: drill slowly, under water to keep everything cool and with a relatively slow rpm (<2000). Drill even more carefully and without exerting much pressure if you are making a hole in glass. So, once again I have decided to go with cylinder bits and I want diameters of 1-2 mm. I usually order large quantities, say 300 – 1000 bits. I did a google search for ‘1 mm diamond drill bits’. Here is what I got. The prices are per drill bit. I read every web site in detail and looked at the “about” section. That tells me whether the seller has first hand experience with drilling stones. I have previously bought drill bits (and other stuff) from Dad’s Rock Shop. They are good quality, but their current prices are not competitive. I have bought poor quality bits too, but not from any of the suppliers mentioned above. I was somewhat interested in the drill bits from Bay Treasures because these are clearly lapidary enthusiasts and concerned with quality products. However, I think I am going to go with Daniel Lopacki. His prices are very competitive if you buy in bulk. And the website includes great tips for drillers. They know how to do it and have done it themselves and quality bits are a concern for this seller too. As you can see, you can get bargains on Ebay. I have had variable success with these bits depending on the vendor. But check out the comments below, because Seth from fans4pc managed to change my mind on his diamond bits which are both well priced and good quality. For drilling holes in glass, check this new post out!